I have a super cute September Sock Monkey digi from BUGABOO STAMPS so we decided to use that for our ATCs. We also thought it would be fun to make the ATCs look like chalkboards. We started with black cardstock and rubbed chalk all over it, then used a dry paper towel to remove the excess chalk. 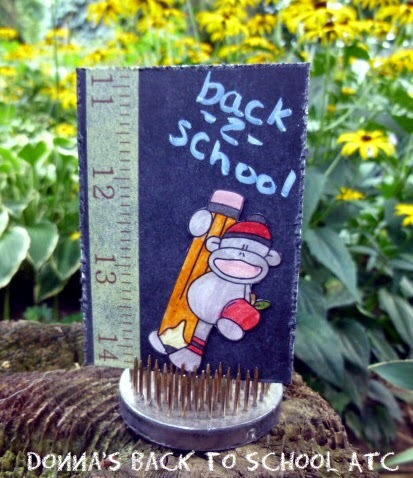 I used Tim Holtz distress markers to colour my ATC, added ruler washi tape to the side and used the Picket Fence distress marker to write "Back 2 School" in the corner. While he is not AT ALL excited about going back to school, Joel liked the idea of making a Back to school ATC...he used SU markers to colour his ATC and got a little more creative with the washi tape than I did. He also thought the sock monkey would enjoy playing basketball on the school yard, so he drew a basketball for him to play with. Awwww....two cute and cleverly put together ATCs. 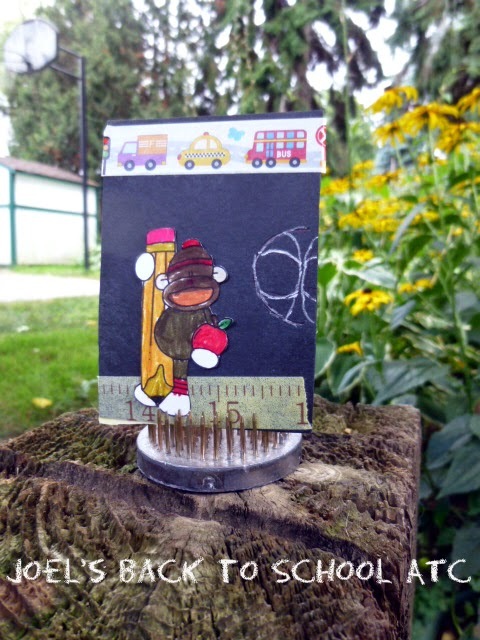 The chalkboard idea certainly fits the Back to School challenge, as does Joel's fabulous basketball! Thanks for playing along with us at Wicked Wednesday!